28-year old American (has also Bissau-Guinean passport) guard K.C. Rivers (196-98kg-87, college: Clemson, agency: Lanshire Group) left FC Bayern Muenchen (BBL). In 13 games he was eighth best scorer with 15.0ppg and averaged 3.4rpg, 2.2apg and 1.0spg this season. Rivers also played 10 games in Euroleague where he had 10.8ppg, 2.3rpg and 1.3apg. The last season he played at Real Madrid (Liga Endesa) in Spanish league. In 42 games he recorded 5.7ppg and 1.9rpg. He helped them to win the league title (in both Spanish Liga Endesa and Euroleague !!!) and the supercup. 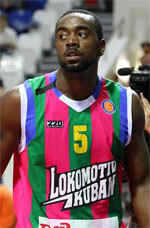 Rivers also played 29 games in Euroleague where he recorded 5.2ppg, 2.2rpg and 1.1apg. He contributed to his team winning the Euroleague championship. The previous (13-14) season Rivers played at Bighorns in D-League. In 47 games he recorded very impressive stats: 15.8ppg, 4.0rpg, 2.2apg and 1.3spg in 2013-14 season. In 12-13 season he played at BC Khimky Moscow Region (VTB) in Russian league. The team played in three different competitions (!!!) that year, and Rivers was exposed to basketball on different levels. In 13 VTB games he recorded 8.5ppg, 2.5rpg and 1.1apg in 2012-13 season. He contributed to his team ending the regular season as at the second position in the league. Rivers also played 24 games in Euroleague where he recorded 9.6ppg, 2.7rpg and 1.5apg in 2012-13 season. He also played 24 games in VTB United League where he recorded 8.6ppg, 2.2rpg and 1.4apg in 2012-13 season. He contributed to his team making it to the semifinals. In 11-12 season Rivers played at Lokomotiv (VTB) in Russian league. The team played in three different competitions that year, and he was exposed to basketball on different levels. In 17 VTB games he recorded 11.4ppg and 4.4rpg in 2011-12 season. He contributed to his team making it to the semifinals. Rivers also played 8 games in Eurocup where he recorded 9.5ppg, 4.1rpg and 1.3apg in 2011-12 season. He also played 19 games in VTB United League where he recorded 11.2ppg, 4.3rpg, 1.0apg and 1.2spg in 2011-12 season. In 10-11 season Rivers played at Virtus Obiettivo Lavoro Bologna (Serie A) in Italian league. In 18 games he recorded also remarkable stats: 17.5ppg, 4.2rpg, 1.6apg and 1.9spg in 2010-11 season. He was voted All-ACC Honorable Mention back in 2009 at his college time. Rivers has played previously professionally in France (Chorale de Roanne) and Italy (Benetton Treviso and Latina Basket). He attended Clemson University until 2009 and it is his seventh season as a professional player. Rivers could be described: One of the top all-around players on the team, he possesses a strong basketball IQ. Has shown to be a solid rebounder. Can score in lots of ways, he's also a good defender on both guards and forwards.